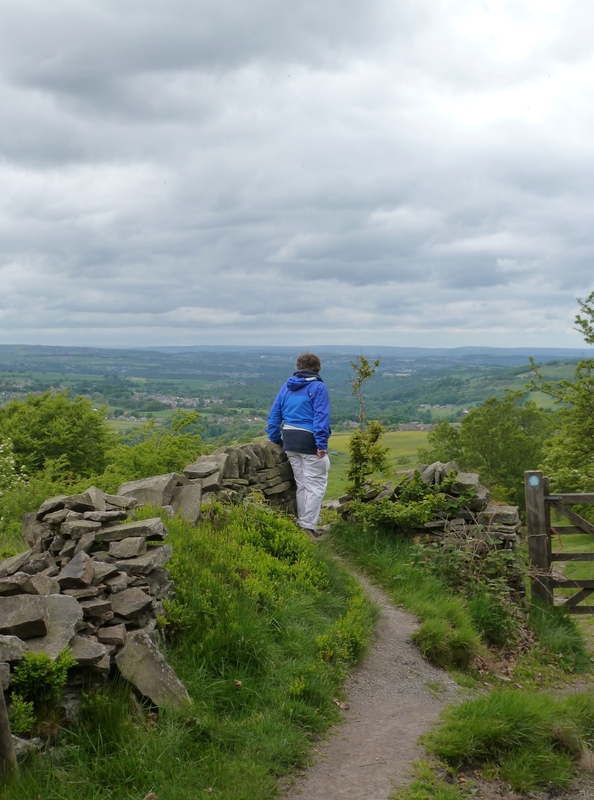 We enjoy some panoramic views of West Yorkshire’s Holme Valley by taking a circular walk around Cheese Gate Nab. Along the way we find some geocaches and take a wrong turn which brings unexpected gifts. 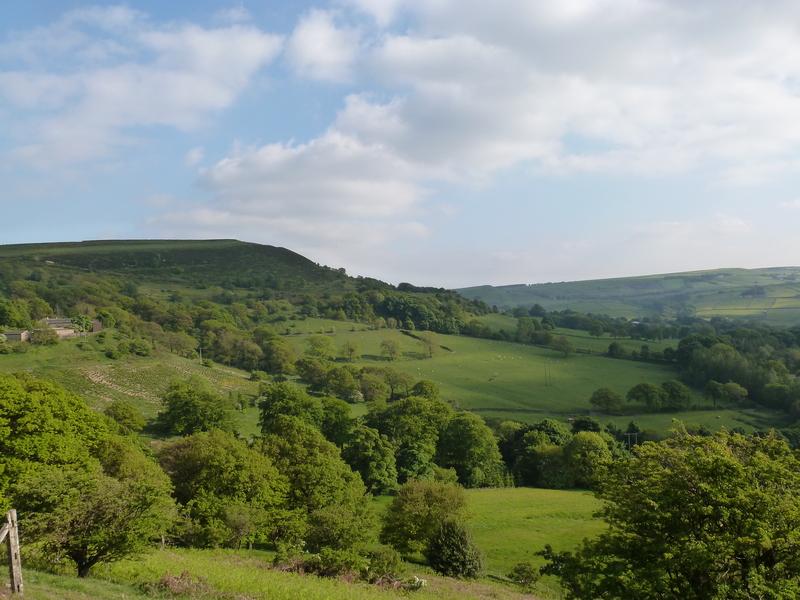 The picture above is a great example of a nab — in fact, we saw the opposite side of this same nab from the slopes of Cheese Gate Nab itself during our walk. You’re seeing this other nab as an example because we photographed Cheese Gate Nab while actually standing on it, so its true nab character isn’t really apparent. 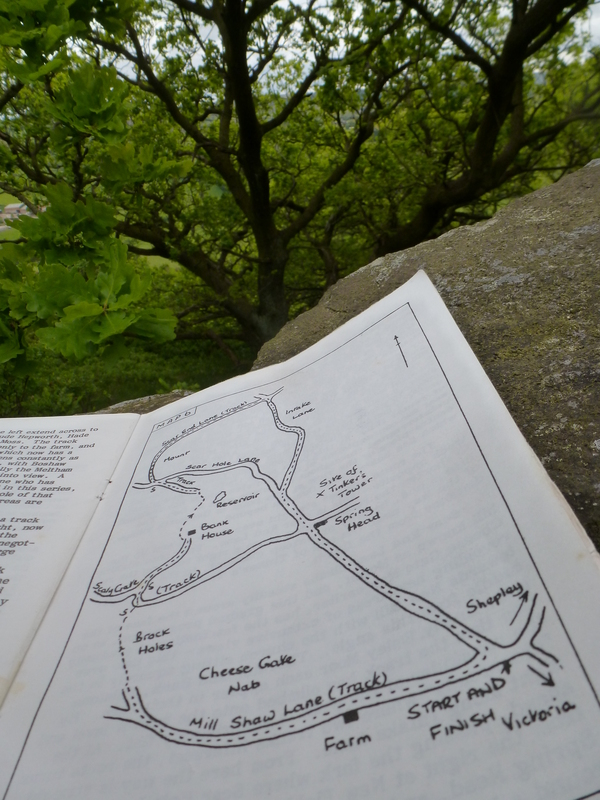 We were inspired to take a circular walk around Cheese Gate Nab by dagdvm’s nephew Sam, who read about it in “Circular Walks in and Around the Holme Valley,” a 1971 pamphlet (updated in 1981) that describes a series of local scenic walks in great detail. Sam had taken the walk a couple of days earlier and thought dagdvm and I would enjoy it. He came back with some great photos of the valley. “Circular Walks” author F.C. 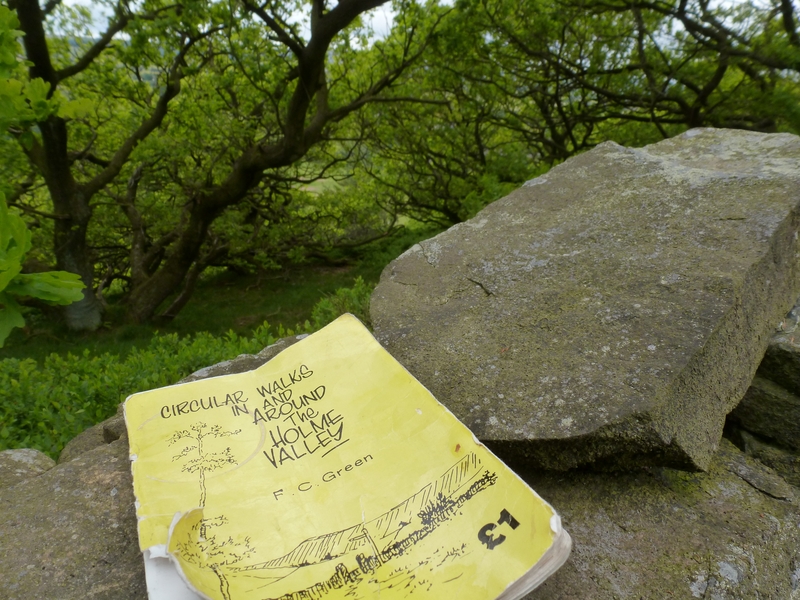 Green’s vivid descriptions of Holme Valley vistas visible when walking clockwise around Cheese Gate Nab were also very persuasive. Finally, we were very happy to see that geocache owner burtonwanderers had placed a series of geocaches all along the walk. 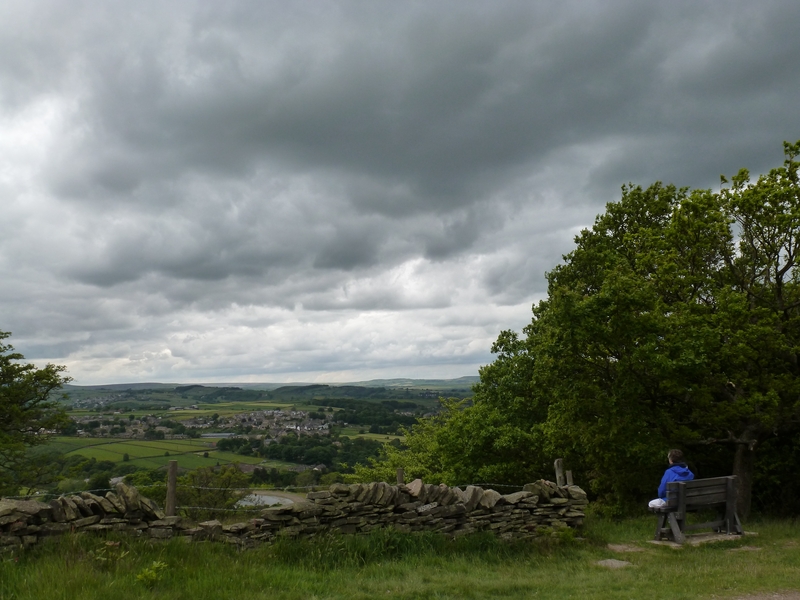 The skies were low and heavy on the afternoon of the 12th as we borrowed Sam’s copy of “Circular Walks in the Holme Valley” and drove to author F.C. Green’s suggested start point. For the first time since our arrival on 7 June we actually wore rain gear, just in case. We’d already spent four straight warm days in brilliant sunshine and thus were fully prepared for northern UK June weather to resume normal service. One of the best things about our walk was reading F.C. 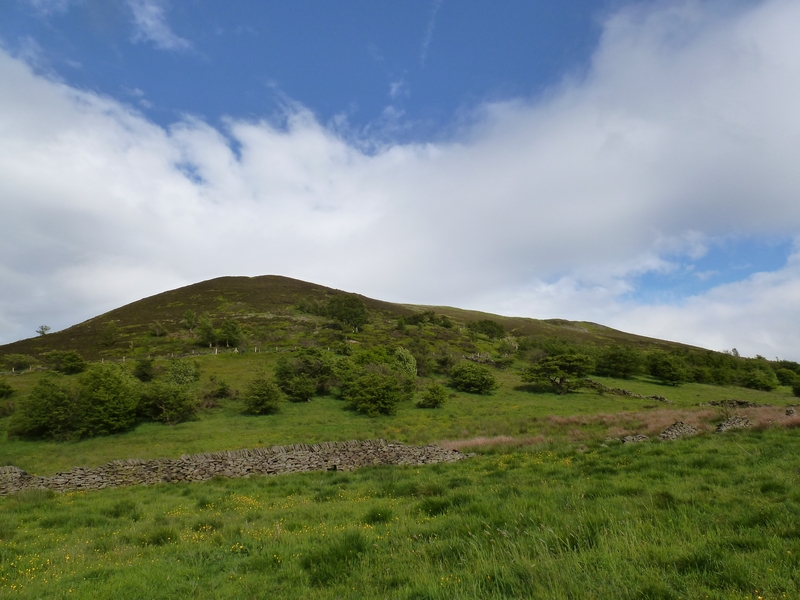 Green’s 32 to 42 year-old descriptions of Cheese Gate Nab and its surroundings while standing in many of those very same spots. Most were still much as the author described them. It’s one of the things I liked most about touring through Yorkshire and Northumberland — so much of the landscape and so many of the villages still exist as they’ve existed for centuries. 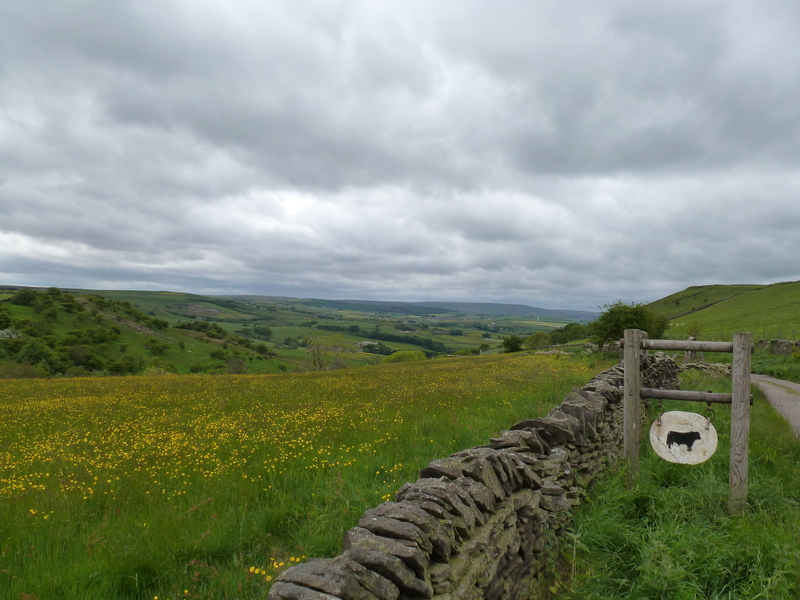 …and we walk onto a cleared sloping plateau, part of Cheese Gate Nab itself, that curves around a sharper uplift of Cheese Gate Nab to the east (out of view to the right in this photo) and drops off into a wide panoramic view of the Holme Valley to the west. It wasn’t long before we were standing on the spot that both Sam and F.C. Green had raved about. Turning clockwise to the north, we see the nab I’d photographed two days earlier. It’s the same nab in the first photo in this post, viewed from the south. Turning further clockwise and facing east, we see the top of Cheese Gate Nab itself. This video covers the same terrain shown in the above three photographs and also gives a brief look towards the south. We spent quite a while at this spot taking in the wind and the clouds and the wonderful view. Eventually we arrived at another point referenced by F.C. Green, a bench with another beautiful view of the Holme Valley. 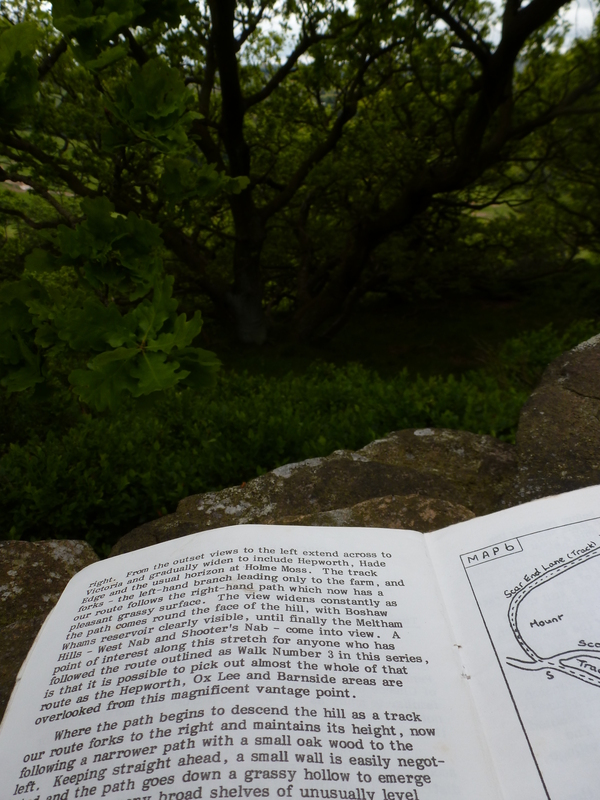 By this time we’d found three of the four numbered geocaches burtonwanderers placed along this circular walk, in the following order: A stroll around Cheese Gate Nab /3. (GC1PW22), A stroll around Cheese Gate Nab /2. (GC1PW0D), and A stroll around Cheese Gate Nab /1. (GC1PVW5). At the end of our day’s walk, dagdvm’s persistence paid off for us and she found A stroll around Cheese Gate Nab /4. (GC1PW3D), the one we’d looked for and couldn’t find soon after our arrival. Thanks to burtonwanderers for this geocache series. Hopefully we’ll be back to find their fifth Cheese Gate Nab geocache. As the first real rain of our vacation started to fall — it would last for an hour or so — we took a little deviation. We wanted to continue following F.C. Green’s map north around the lower slopes of the unnamed nab pictured above and then southeast around the backside of Cheese Gate Nab to our starting point. However, we were uncomfortable with walking down the unmarked private drive the map led us to even though the drive functions as part of the public path around the two nabs. So we kept moving west, sharply downhill (that should have been a clue :)) and across a road we later realized was Sheffield Road, through some woods, across a footbridge over a stream and steeply up a public path into…Hepworth! A bemused older woman watched us huff and puff our way up to where she stood outside the local funeral home. “You two look a bit done in,” she said, smiling up at us from under her umbrella. We decided to retrace our steps instead of completing the full circular walk, so she helpfully sent us on our way east back downhill via another public path. 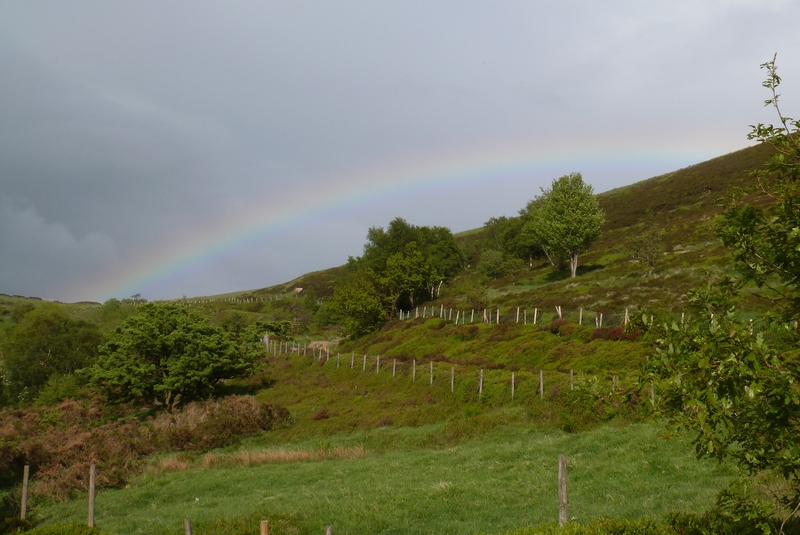 …and there it was — a rainbow over the northern slope of Cheese Gate Nab! I don’t think we’d have seen this if all had gone as planned. Sometimes a wrong turn can lead to something beautiful. 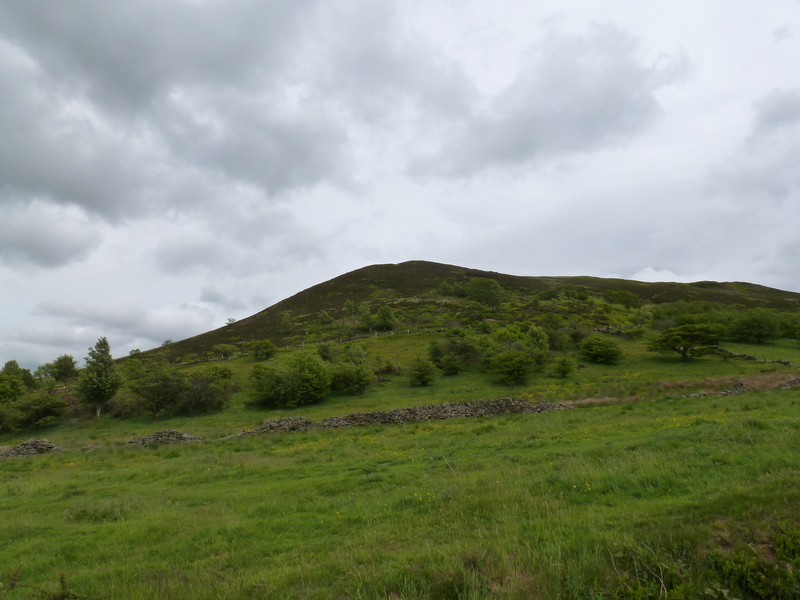 As we walked back to our car through Cheese Gate Nab’s sloping plateau, the clouds gave way to some blue sky. The constantly changing weather gave us different views of the same places in a single afternoon, yet the underlying beauty of the scenery remained unchanged. F.C. Green looked over the same valley others had seen centuries earlier, and Sam, dagdvm and I enjoyed the identical views decades later. Hopefully this scenic landscape will be there for others long into the future. Thank you Sam, for suggesting this walk to us. Thanks again to burtonwanderers for placing geocaches along this circular walk around Cheese Gate Nab. For a look at the area including landmarks photographed during our walk and mentioned here, please see this map. 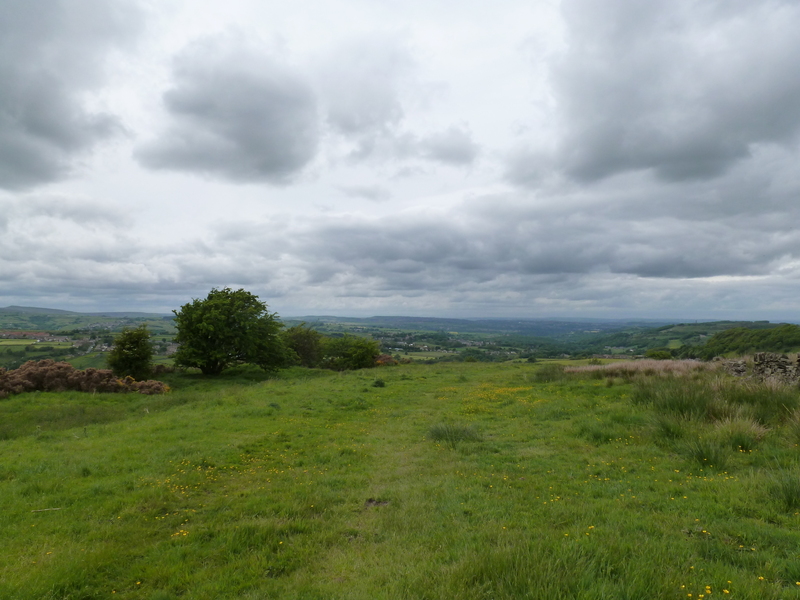 This entry was posted in found it, road trip, UK June 2013 and tagged A616, burtonwanderers, Cheese Gate Nab, F.C. 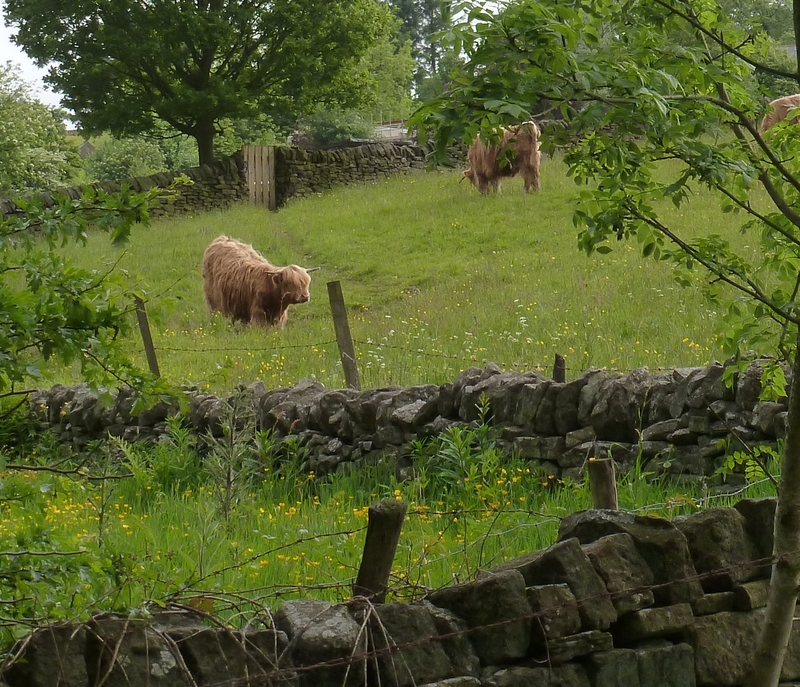 Green, geocaching, Hepworth, Highland cattle, Holmfirth, nature, Outdoors, photography, photos, Scholes, Sheffield Road, travel, UK, West Yorkshire. Bookmark the permalink. Yes, it really is. 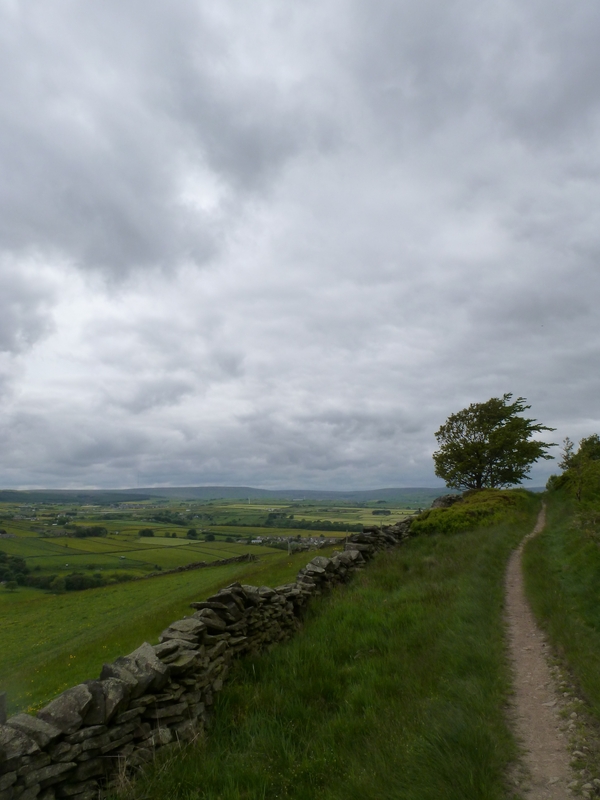 My pictures can’t do it justice, and I know a lot more about the Holme Valley now than I did that day. We just did our best to take it all in. Hopefully we’ll be back there soon!